If you are wondering whether or not to get this game, read through this sequence of events. If you like what you read, I highly recommend getting the game. 21. Collect a piece of Goyle and return to Moaning Myrtle's Bathroom to transform into him. 22. Once you are transform into Goyle, you must find the Slytherin Common Room. Once inside, find Draco and talk with him. 23. While talking to Draco you begin to transform back into Harry. 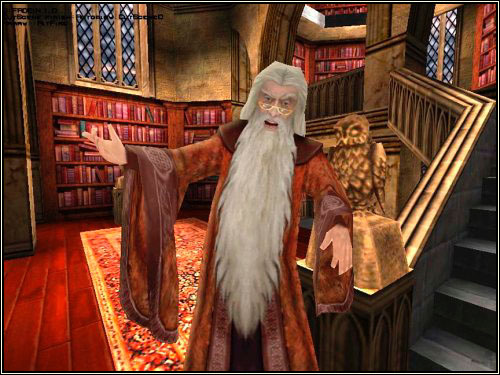 You must now sneak out of the Slytherin Common Room, avoiding the Slytherin Prefects. 27. Ron comes and tells you to meet him in Moaning Myrtle's Bathroom because she is having a tantrum. Once you arrive at Moaning Myrtle's Bathroom you find T.M.Riddles Diary, and he reveals to you who opened the Chamber of Secrets the 1st time. 28. Ron tells you to follow him to Hagrid's Hut. Once there, you observe Hagrid and Dumbledor being led away by Lucious Malfoy. Heeding Hagrid's advice you (Harry) and Ron decide to follow the spiders into the Forbidden Forest. 29. Harry is confronted be Aragog and his spider children and Harry must 1st fight off the spider children and then defeat Aragog before he is rescued by Ron in the Flying Ford Anglia. 30. You find out Hermione has been petrified, and go to visit her in the Hospital wing. There, you find her clutching a helpful note. 31. You find out Ginny has been taken. Ron runs off to fetch Gildroy Lockhart and you go to Moaning Myrtle's Bathroom to see if you can find the entrance to the Chamber of Secrets. 32. 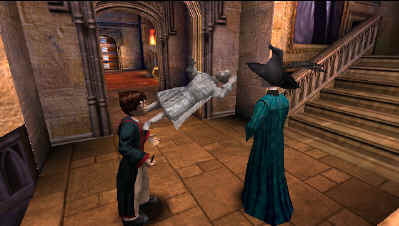 You find the entrance and you (Harry), Ron, and Gildroy Lockhart enter the Chamber of Secrets. 33. 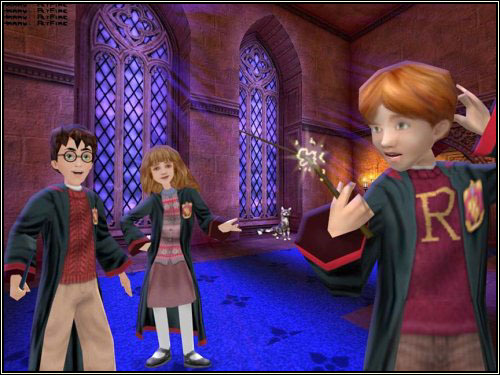 You (Harry) venture out on your own, and after a while find Ginny nearly dead, and find out T.M. Riddle is a younger Voldemort. 34. You are forced to fight for your life because T.M. Riddle commands the Basilisk to kill you. 35. After defeating the Basilisk attend the End of Year Feast in the Great Hall.